Seeing the recent thread that Days Gone's 67GB is Sony's largest first-party game in terms of file size (edit: this is only at launch! ), I became curious as to what could be the largest game from various companies. The obvious ones I wondered about are the Big Three, but I wonder about other companies too, like Capcom or Square Enix. I tried Googling and nobody seems to have definitive answers. It'll take a lot of research unless news stories report for us (in Days Gone's case, for instance), but I think you should be able to make a few educated guesses and then you should be able to find out fairly easily. 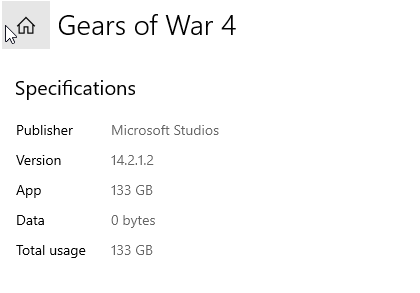 For instance, from experience I know that Gears of War 4 has a huge download size, since I downloaded it at launch on PC. However, what I didn't know is that including DLC and such, the game supposedly hit a whopping 350GB! The one I'm most curious about is Nintendo. I have to assume the biggest game they've ever made is Super Smash Bros. Ultimate... but that's only 13.6GB. Breath of the Wild, for as sprawling as it is, clocks in with all DLC at 15.6GB. And yet, Xenoblade Chronicles 2 and its expansion hits 16GB. If that's the biggest game Nintendo or its subsidiaries has ever released... that's rather impressively svelte! However, perhaps I missed something. Let me know, and if you're curious, post your own findings! Nintendo was able to get Xenoblade Chronicles 2 down to a reasonable size by removing most of the audio by having the characters say the same thing every 4 seconds. XCX is 22GB. XC2 isn't Nintendo's biggest game data wise. Days Gone isn't the biggest Sony first party game in filesize, that title goes to Gran Turismo Sport with it's 100+GB. i don't remember gears being that big. isn't it like 100gb? Uhhhh can we get an image of Gears being that big because I thought it was about 100.
here we go. 114gb for gears. Final Fantasy XV (with the DLC and patches) is around 105+ GB. This is 10% of my allotted data by my ISP per month. That's wild. MLB The Show 19 is 72.11 GB, so Days Gone is not their biggest game. Sometimes I wish it was 2010 again when games had to fit on an 8GB DVD. Is that with or without the optional packs for increased loading? I imagine without but just checking. Gears of War 4 at 350GB? Haha wtf. Last I checked it was just slightly under. This is misleading. Days Gone is the largest day one filesize for Sony, but it's definitely not the largest overall file size. The other numbers (Gears, GT) are with patches and additional content, I assume. It doesn't really make sense to compare day one sizes to "complete" sizes. Gears of War 4 is NOT 350GBs. and Final Fantasy XV is 83.9 GB over Deus EX's 57.4. I imagine a decent amount of data is repeated on the disk to reduce load times so a potential Switch version would likely have a smaller file size like many other Wii U to Switch ports. Not sure if they could get it under 16 GB though. Quantum Break is 178gb on X if you install everything iirc. That's gotta be up there. It's inflated by the video downloads though. Resonance of Fate remaster (tri-Ace) is 80GB. Hitman 2 on PC right now is 116GB and will only be climbing with new content coming soon. It's basically two full games though at this point, combined into one install. Gears is a third of that size, OP. RDR2 may be the biggest game to ship, at 100GB+ over two discs before patches and updates. Sorry, I didn't realize about Gears 4! I'll update the info. I had seen on Quora that someone had something like a 250GB update. My bad! Also, XCX being bigger than XC2 is... weird. But this is what I meant by missing stuff! I'll change that up too! Yeah, I wonder if that's just how much someone had to download before it actually finished installing because I remember a lot of people saying that their downloads wouldn't complete and they'd have to redownload from scratch over and over again. I think I remember seeing the same for Forza Horizon 3 when that came out too. God, that's still so beautifully small in modern terms. Nintendo are the last remaining heroes of file compression and low storage footprint. ok, we need to have a clear definition of such an obituary term as 'large filesize'..
is it 'largest file size' at launch or is it 'largest' as of now/by the end of its lifecycle with all updates/dlcs? That's what I'm saying! Days Gone definitely isn't the overall largest file size for Sony. I was thinking about this a bit more too since I realized that Days Gone was only the largest launch file size for Sony. I think it'd be best to go with the end of its lifecycle, but obviously with new releases it'd be hard to do that since... well, they're new. So at the moment, I'd say do what you'd do with anything like a GaaS or MMO title: list the current size and then make sure you mention that it's at the time of the posting, since I know something like FFXIV is getting another big expansion pack soon which is gonna bump its file size up. This was actually part of the impetus for this thread. As I said in the OP, I knew Nintendo was extremely efficient with their space usage so I wanted to compare to other companies, especially ones with AAA titles. It's reeeeally impressive to me, as I said above. It's not much smaller on PS4, at over 60GB (with all 3 DLC packs installed). I have no idea why it's so big. I adore the game, but it's certainly not a looker (barely above a PS3 game; hell, play it in 60fps mode on a base PS4 and you'd swear it's a PS3 game, albeit at 60fps) and it's not like it has a ton of enemy or enviromental variety. Another thing is games with 4K textures/movies pack...are we including those as well? For nintendo, it's kinda apples and oranges. For one, they had to do it because their machine had the smallest storage option available. For another, most of their games don't really go beyond 1080p so the amount of texture data in their games are much smaller compared to the PS4/XBX/PC counterpart. Prerendered cutscenes, uncompressed textures and audio are the cause of bloated file size. It’s not the actual install size but for WB, I know Hitman 2 was a crazy size on PS4 if you downloaded all the previous game’s content as dlc from HM1. It was well over 80 GB + patches. Yeah that thing is enormous with the high res pack.